The yellow woollybear is generally known by its larval stage, a large yellow-red to light brown caterpillar which can do substantial damage to host plants. Found throughout all of North America, the yellow woollybear is active from spring to winter. 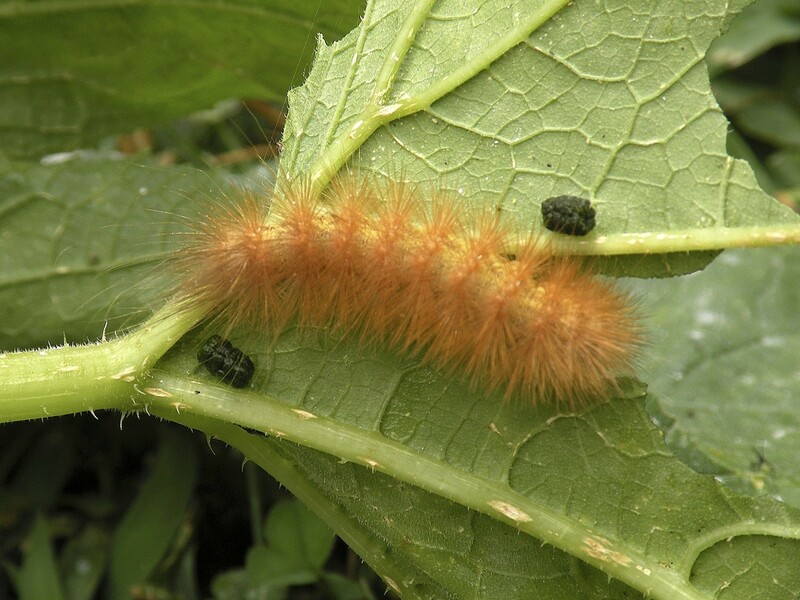 The caterpillar of the Virginia Tiger Moth or the Yellow Woollybear Caterpillar is pictured here. The Woollybear is feasting on a prickly squash leaf. Yellow woollybears overwinter in their pupal stage and in early spring, will emerge as a white moth approximately 40 mm in length. Once active, females will mate and begin egg laying targeting any leaves they think will serve as good food for their soon to hatch young. The larval stage of the woollybear will eat most any plant grown in the garden as well as many species of ground cover found in most any landscape. Feeding larvae will ravish leaves putting stress on host plants. After 4-5 weeks, larvae will search for a good location to pupate and in another 2-4 weeks, emerge as an adult moth. Foraging larvae can be controlled with THURICIDE. This product uses a bacteria which young woollybears are vulnerable to and once they ingest some, they’ll die in a few days. 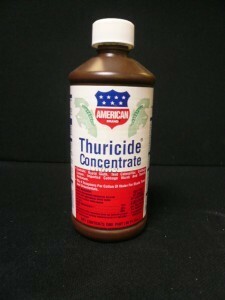 Thuricide is safe to use on any plant and can be sprayed as often as is necessary. 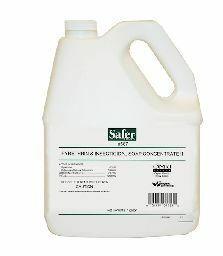 Add 1 tablespoon of Thuricide per gallon of water and use the spray to cover up to 800 sq/ft of plant foliage. Retreat weekly until all caterpillars are dead. 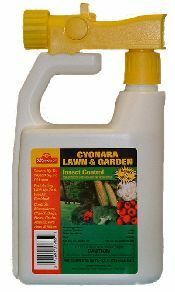 If you want another organic option that works quickly, go with MULTIPURPOSE INSECT KILLER. This product works more like a traditional spray in that it will kill on contact with fast results. Most larvae will die within 5-10 minutes after being sprayed and treatments will usually remain active for a week. Add 6 oz per gallon of water and use the mixture to cover up to 800 sq/ft of plant foliage. Retreat weekly until all caterpillar activity is stopped. For general ground cover and trees which won’t be producing fruit or vegetables, go with a more traditional product like CYONARA RTS. 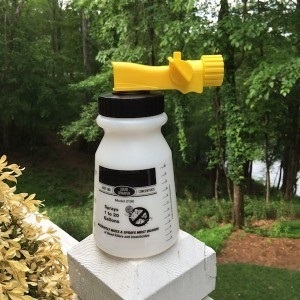 This product can be hooked to your garden hose and sprayed over any plant. It will both kill active larvae and repel adult females so they won’t be interested in laying eggs on your plants. Use 1 quart per 1/2 acre. Retreat once a week until all activity is gone and be sure to spray the side of your home if you have larvae crawling onto the siding looking for a place to pupate. Spray once a month to maintain the property so they don’t return. Once plants and a home have activity, they’re more likely to continue with a problem because the adult moths leave a strong pheromone scent to mark good plants and egg laying sites. For larger lots, CYONARA CONCENTRATE will prove more cost effective to apply. Use .75 oz per 5,000 sq/ft which is about 6 oz per acre. Since yellow woollybears have been known to infest homes, be sure to spray down the sides of your house focusing on any side with activity. 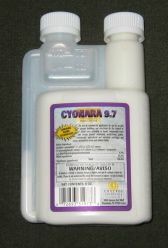 Treatments with any of the Cyonara will usually repel them away from the home and treated plants keeping them from getting inside living areas.